I feel like I'm coming in, trying to blow off the cobwebs, remove the dustcovers, and start setting things to order again. So very much has been happening, it has really been overwhelming at times. I would start to post about things, then it would be too much and I'd put it off. Then it got to the point it felt like I'd never write a catch up post. Like any Practice, the essence is in the present moment. The Now. So what has happened since May? More yoga classes have happened. I teach a total of eight classes a week currently. Seven classes are at studios or clubs, two of which don't require membership to attend. One class I've started under my own business name, Samatha Yoga, is a Yoga for Women class that I hold at a studio space I rent in downtown Portland. In April I started to investigate Integrated Movement Therapy (IMT) as a possible direction to head in my desire to train in a form of Yoga Therapy. That classes are largely held in Washington, Seattle and a little town called Plain, and Portland was part of the appeal. I also heard some really great feedback about IMT from the Executive Director of Living Yoga. I signed up for some group classes on Yoga for Anxiety with one of the IMT instructors and felt a real connection. The more weeks into the program I went, the more interested I became in the ways the IMT approach to Yoga Therapy. In mid-April I took the IMT Basics class as well as the Level I 3-day intensive on IMT for Adults. My hope is to be complete with the program, including practicum and internship, by next winter. In May I joined the Board of Directors for Living Yoga. I was starting to do a dive into helping improve the usefulness of data and some software-as-a-service type tools when August rolled around with a huge pile of Big Life Changes. A sudden increase in stress, combined with the realization that the schedule I'm taking for my IMT studies conflicts with many of the Board meetings, as well as wanting to take as many teaching positions as possible right now to help extend our savings further, led me to the decision to leave the Board. I'm hoping I may be able to revisit joining sometime in the future. 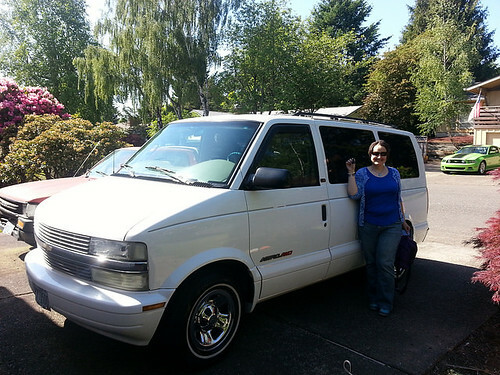 Also in May, we purchased a used 2002 Chevy Astro Passenger Van. We'd done some research on vans to facilitate moving props to group classes and for us to camp in. The Astro was the winner and we found a good one at a very small dealer near our house. In early August, after several years of not being heard or respected, among other things, CK decided to leave her position at her high tech, high stress job. Right now she's been taking it easy and deciding what she wants to build. This whole event gave us some rather intense weeks throughout the month as we got closer to her last day, August 27th, the day before my birthday. On August 26th I received a truly mean, spiteful letter in the mail from my Mother. Thankfully I had an appointment with my therapist scheduled for the 27th in anticipation of birthday blues, so the letter got immediate attention. I have wondered if she's trying to provoke me into responding somehow, or if it is just pure maliciousness and making sure she gets the last word in. In the future I'll be returning mail from her unopened. Then I was 46 and we had a relaxing day. 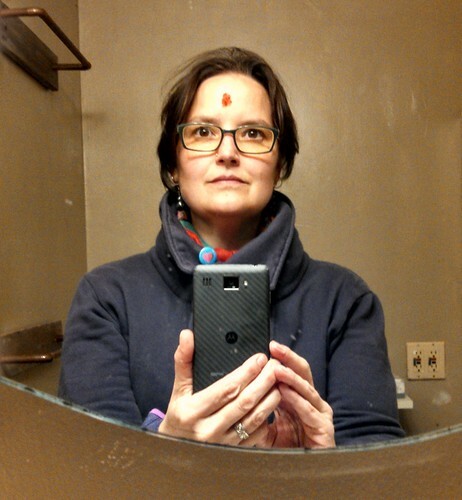 I taught a yoga class, because I wanted to, and otherwise we just had a mellow day. We ended the day with rock & roll; seeing Steve Earle & the Dukes perform. I am happy to report that 46 is not too old to rock and roll, however, I personally recommend at least a day's recovery time afterward. 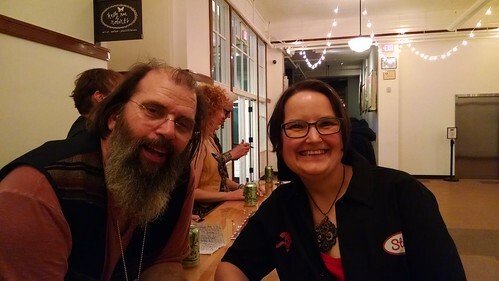 To make my birthday extra awesome CK snapped a picture of Steve Earle and me. She also told him it was my birthday and he signed a personalized message on the concert poster we'd picked up. That brings us right in September. The first week CK was officially not working she built a beautiful book shelf for our living room. I spent the first week of the month getting ready for the two-week, residential training retreat I had coming up. The official Samarya Yoga Teacher Training intensive, held at the Grunewald Guild in Plain, Washington. Given some of the experiences I had with Zen sesshin practice, I had a lot of anxiety going up there. Not to mention the heightened stress I was under due to the rather busy August we'd had. Still, can't keep putting things off until I feel "strong enough" to do them. 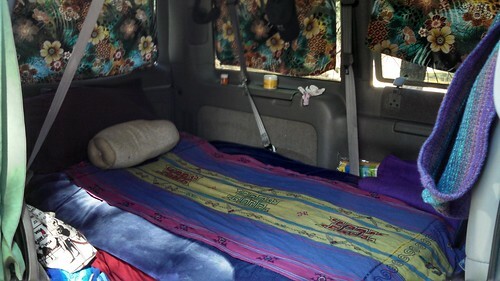 To make it a little easier on me I outfitted the van for a camping try-out. I had power, so an electric blanket to stay warm during the chilly mountain nights as well as power for my laptop and my very own electric kettle. I also made some snazzy curtains to cover all the windows. I ended up flipping the bed around, finding that those back doors let in quite a draft. I came away with several items to improve the experience. The suction cups to hold the curtains need better positioning, and perhaps more of them. I want to find a way to block the back doors. Other than that, I was very comfortable in my little van-cave and so grateful for a place that offered total retreat when I was overwhelmed. The training was intense. Upon returning and starting to catch-up (debrief) with my therapist she asked me about making a list of everything that came up, so we could prioritize them. I looked at her without blinking and told her that Everything had come up, in due time, across the long days of the retreat. It was at times a tour through trauma. It was at other times hugely uplifting, the satisfaction of learning deeply, curiosity encouraged, dynamics of human interaction explored, the practice of gratitude established, an understanding of sisterhood unfolded, and so much more. The picture is of me just after our closing ceremony (still have taken very few selfies, but this one isn't too bad). 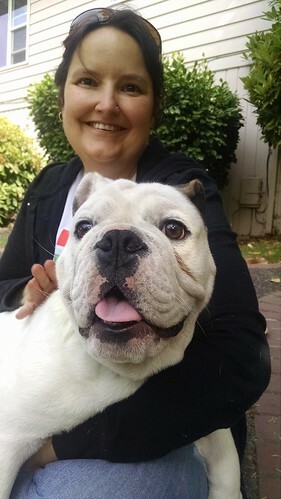 I was back home for 5 days after that experience, teaching all my classes, and then up to Seattle for a 3-day intensive on Level I IMT for Teens. I'm working on getting my time with my mentors done, hopefully over the next few weeks. In mid-October I'll have the 3-day intensive on Level I for Children. I leave again for Plain, Washington on November 1st for the 1-week, IMT Level II intensive.